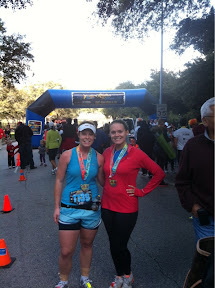 This morning I ran another half marathon. It was the 1st annual Rhythm and Blues and they had all kinds of bands on the race course. Which was good since it was a three-loop course of underpasses... Not my favorite. A few weeks back my friend Nikki told me her and her bf Bo were planning to run it, but then he found out he was going to out of town for work. 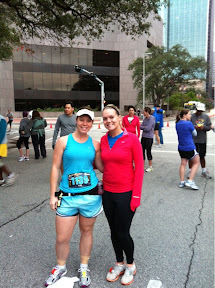 I knew I needed another race if I was going to keep running so I offered to run it with her. We went on the last few training runs we needed and had a blast. Nikki is faster than me, but she said I pushed her on distance do it was a good match. I've been having some post-tibial tendinitis from on both ankles from over-use. Go figure! I've been taping before long runs an it's helped a little. Well, it's a good thing Bo was running so Nikki would have a partner. I crashed again. Seems to be a recurring theme in my last few races. 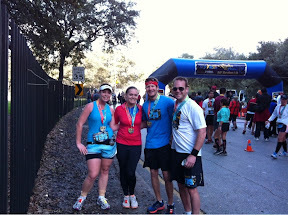 Between my ankles and my unusually high heart rate (between 89-92% of max the whole time), I was just thankful to finish. And I've decided I need a break from running for a bit. It's not uplifting right now and I'm not enjoying it like I should. I think a break while I continue to train for the MS 150 will be nice. 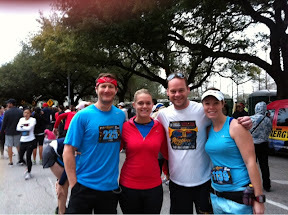 Bo, Nikki, Mark (Bo's hungover friend who kicked all our butts on three hours of sleep- hate those natural runners ;-) ), and me.